And since today's a Holiday, there's an antique show at the Bayview Mall. Didn't buy anything, didn't take any pix, but did have a delish brunch. However after that, we were invited to preview a couple of Estate Sales. And by preview I mean only a few people had been through to cherry pick these two estates, both in fine neighborhoods, before they're thrown open to the public for a contents' sale. The houses have both been sold and have to be cleared. We didn't get very much there but there was some vintage clothing we did buy. The vintage I'm talking about is recent vintage, non-designer, but fun and sale-able. 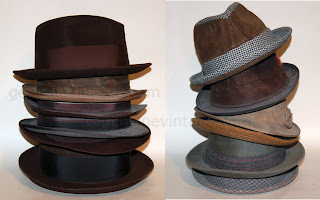 A great stack-o-hats which will be sold cheaply, pictured above, and another stack-o-ladies-hats. I also scored some wearable-for-me clothing, mostly '70s but in great condition. 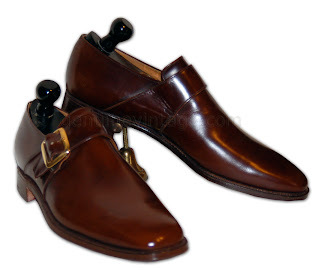 The best, for me, (and it is always about me, me, me) was a pair of 10 or 20 year old Church's monk strap shoes, never worn. As Rachel Ray would say: Dee-Lish.